Mary quickly picked a colour scheme of burgundy with blush pink and we started brainstorming. 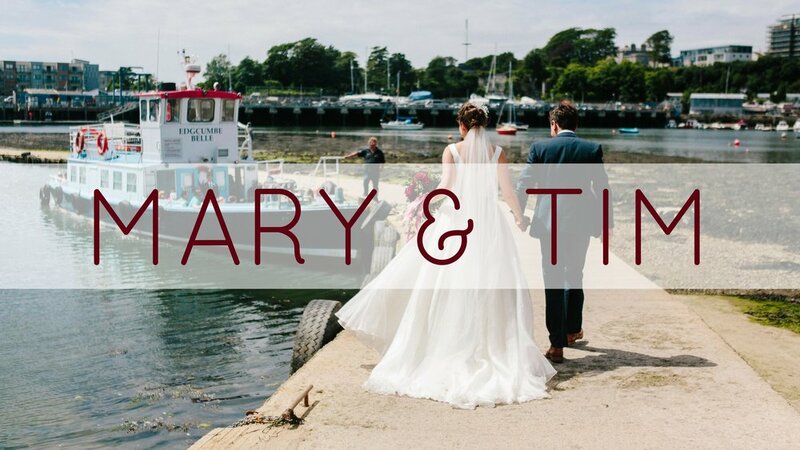 Mary's style is elegant and fairly minimal which was echoed in her gorgeous Stephanie Allin gown so we could afford to get a bit wild and wonderful with the flowers. Her bouquet was filled with garden roses, deep red peonies, seed heads, astrantia and herbs with trailing ribbons, jamine and amaranthus. Our bridesmaid's bouquets contained pale pink and cream roses, dahlias and eucalyptus with touches of drama from the dark daucus, rudbeckia and alliums. More trailing muslin ribbon matched the buttonholes, each individual with roses, herbs and garden flowers. 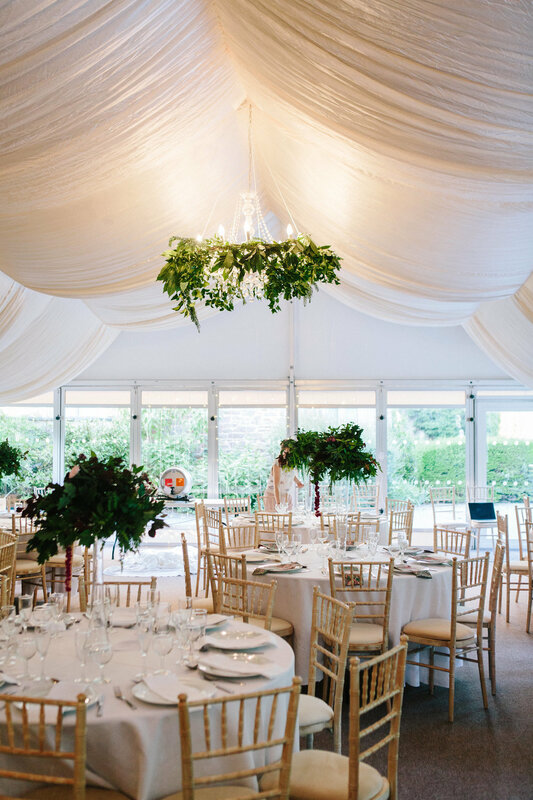 In the marquee, Mary's friends from work and Tim and his brother helped make foliage wreaths, suspended around the chandeliers and draped with ivy, bay, acacia, smokebush, eucalptus and leylandii. The centrepieces, elevated on clear glass vases, contained the same foliages with more roses, dahlias, astrantia and amaranthus. We wrapped the cake (that Mary made herself - she's incredible) in jasmine from my greenhouse and added flowers and macaroons. The foliage installations were echoed in the church with similar designs above the altar and paler pedastal designs containing hydrangeas from our parent's garden. Their garden provided tons of the foliage too, as well as some of my favourite textures in the flowers such as the quince fruits, rosemary and acacia foliage. I'm so in love with the photos from Nathan English Photography - it was hard to just pick a few for this post but I've tried to be restrained and not crash my website! 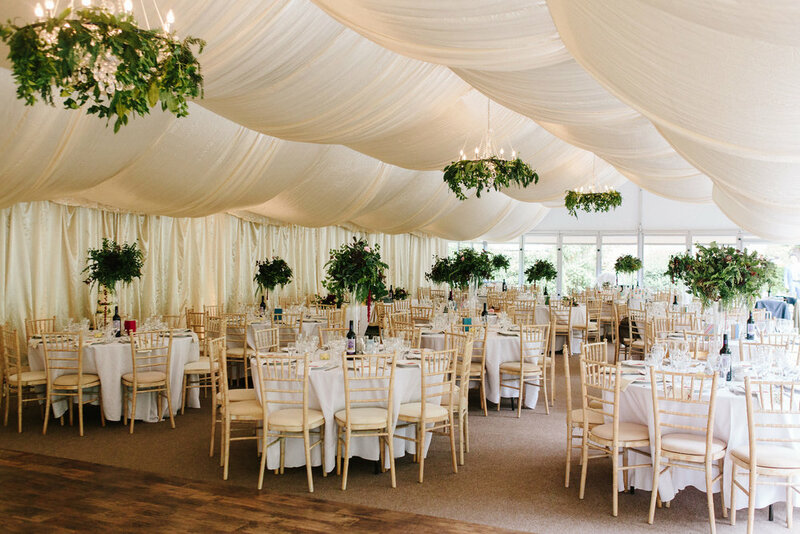 Mount Edgcumbe is a gorgeous country house on the Cornish/Devon border, their permanent marquee is set in a secluded corner of the gardens and makes a wonderful wedding venue, especially as it's served by several water buses from various spots around Plymouth. Chef Francesca Didymus is fairly new to the event catering business but you would never have guessed from the incredible spread she put on for the guests. The food was delicious, plentiful (SO important for a wedding!) and looked gorgeous too. She managed to pull it all off without an onsite kitchen or even running water, and there were nearly 200 people there. Nathan English is a friend of Tim's family from his time in Oxford, although he's now based back home in the states. He's a *proper* wedding photographer - that rare combination of incredible wedding photography skill, the ability to charm tired, elderly guests into smiling for photos and managing to be everywhere and also invisible at the same time. Plus he and his wife were LOVELY and just LOOK at these photos. This was by far the biggest wedding I've done to date, and I am eternally grateful to my parents and siblings/sibling-in-laws for their top babysitting skills!